Apple's plans for a self-driving car may have lost momentum, but it appears the firm has not yet given up on the idea of transforming the automotive industry. The Cupertino firm is reportedly in discussions with British supercar maker and Formula One team owner McLaren about a strategic investment or a full-blown acquisition. These talks are being viewed as way for Apple to revive its secretive self-driving electric car effort, code-named Project Titan, as the two firms have been in negotiations for 'several months'. The claims that the two firms are in discussions come from three people briefed on the discussions, reports the Financial Times. 'We can confirm that McLaren is not in discussion with Apple in respect of any potential investment,' a McLaren spokesperson told DailyMail.com in an email. McLaren is known for producing cars with sleek designs, powerful engines and hefty price tags. 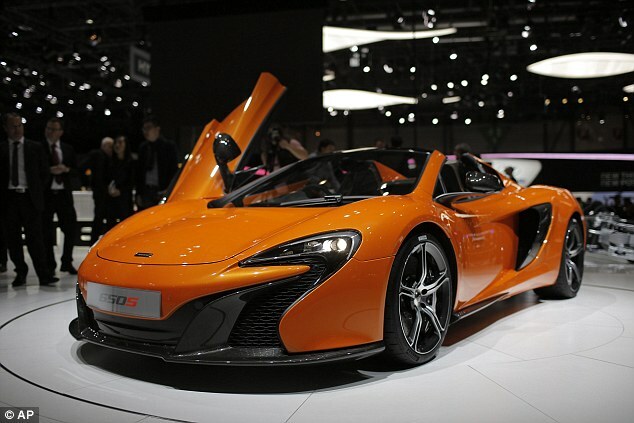 For instance, the McLaren 650S that has a base price of $265,000 and some vehicles can cost as much as $1 million. And the steep prices aren't deterring people, as the firm reportedly sold 1,654 cars across 30 different markets by the end of 2015. According to the Financial Times, a partnership would give Apple access to McLaren's automotive engineering, on-board computer systems and all the materials necessary to accelerate Project Titan. The report said McLaren is valued between $1.3 billion and $2 billion, but it is still 'not clear' if the two will turn these talks into a committed partnership. If Apple were to announce a 'full takeover' this would be the firm's biggest acquisition since 2014, when it purchased Dr. Dre's Beats for $3 billion. But this time Apple, according to people briefed on the talks, is interested in McLaren's technology, prowess and patent portfolio for its iCar that the firm began in 2014. The Cupertino company gathered hundreds of engineers and designers to develop their automobile vision. However, in the past few weeks 'dozens of employees have departed', people familiar with the changes shared. Bob Mansfield, the head of Project Titan, has reportedly shifted the efforts toward building a self-driving system, rather than an entire car. Since news began slowly surfacing about Apple's iCar in 2015, concept videos and drawings shortly followed. A recent video by Luca Wrede shows a build that mirrors the minimalist design common to Apple products. A wraparound dashboard screen shows speed, traffic predictions, and answers calls. The vehicle can pull up Apple Maps, Safari, and Siri, which are indicated all on the interactive dashboard. The concept car can even connect to the Apple Watch. This video is just the latest installment of the unraveling rumors surrounding 'Project Titan,' and may open the door for more questions than it answers.